As expected, WBC super featherweight champion Miguel Berchelt (33-1, 29 KOs) made easy work of replacement opponent Maxwell Awuku (44-4-1, 30 KOs) in stopping him in the 3rd round on Saturday night at the Oasis Arena in Cancun, Quintana Roo, Mexico. Berchelt flattened Awuku twice in the 3rd round. 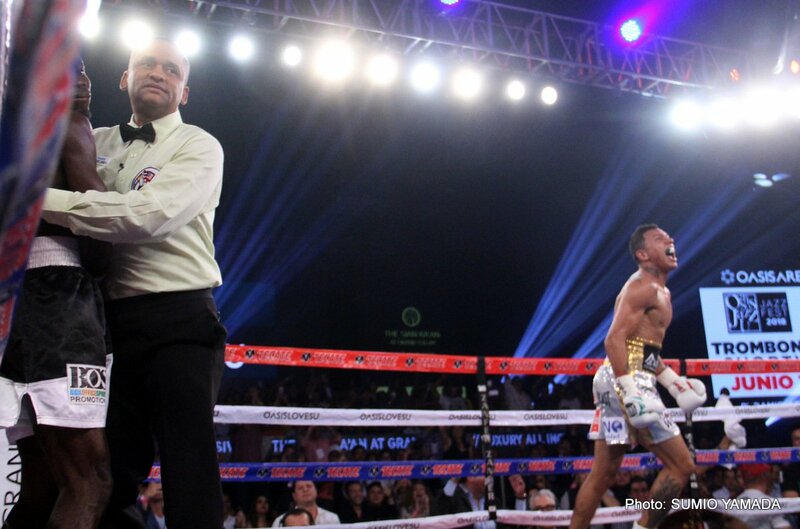 Berchelt finished the job after the second knockdown in connecting with several hard shots that caused the referee to stop the fight. 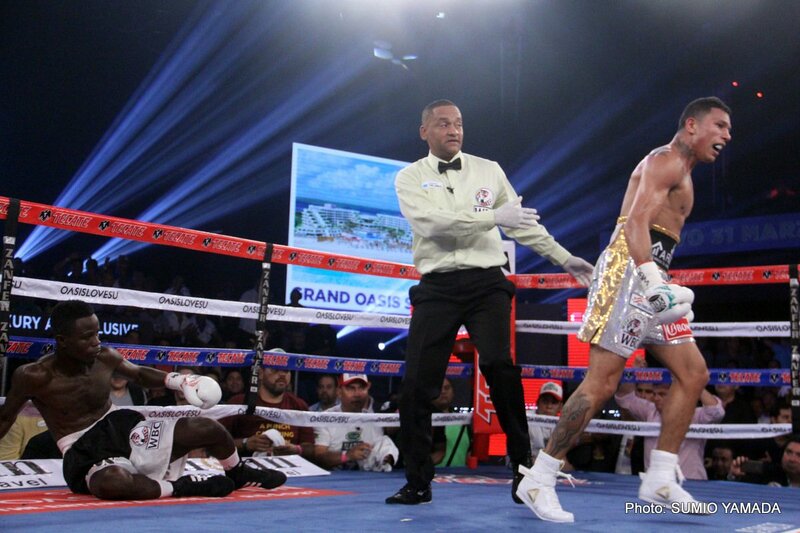 Awuku was still upright when referee Hector Afu stopped the fight. If the referee had waited a moment longer before stopping the fight, Berchelt would have knocked Awuku down for a third time. The fight was stopped at 2:46 of round 3. Awuku wasn’t hurt as bad he could have been if not for the quick actions by Afu in pulling the plug on the fight. Knockdown No.1 in the 3rd round came from a right hand from Berchelt that put Awuku down on his backside. Moments before that, Berchelt had hurt Awuku with 2 hard shots to the head. Awuku had talent the shots, but his legs looked rubbery, Berchelt then put Awuku down with the next right. Knockdown No.2 in the 3rd round came from Berchelt landing a blizzard of shots of Awuku after he’d backed up against the ropes. Awuku slid down onto the canvas after taking the punches. Surprisingly, Awuku didn’t look that hurt. He was hurt obviously enough for him to go down, but he wasn’t staggering or swaying after he got back to his feet. If Awuku was in that kind of shape, the referee would have stopped the fight. Awuku’s corner should have thrown in the towel after the 2nd knockdown, because he was just keep going down if he referee hadn’t stopped the contest. Berchelt was too strong for Awuku, and he wasn’t going to let up on him. The southpaw Awuku landed some shots in all 3 rounds. Awuku was catching Berchelt, 26, coming in and backing away. The punches weren’t hard enough to hurt Berchelt. That was the problem. Awuku didn’t have the power to keep Berchelt off of him or make him pay when he would come forward to land his punches. 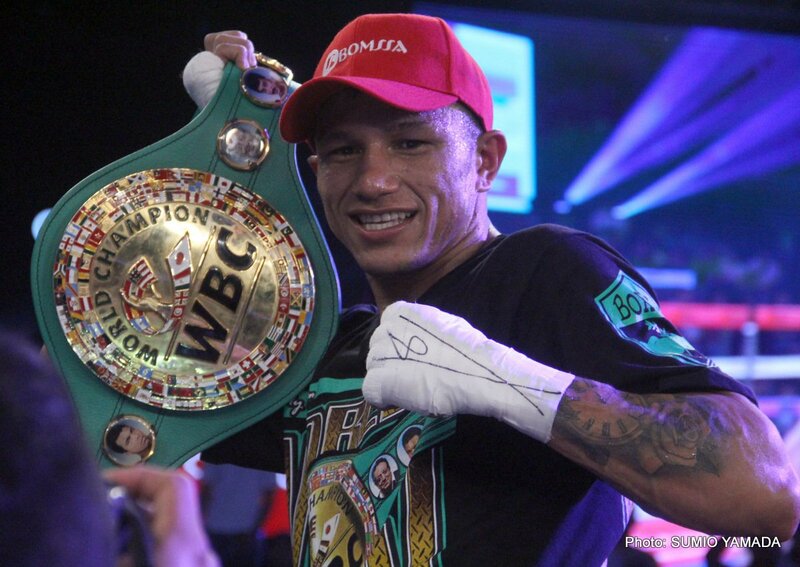 ”I feel very happy and satisfied,” Berchelt said after the fight via Fight News. ”his is a very special night for me. I fulfilled a dream I had as a child. I didn’t feel a punch and from the first knockdown know I would knock him out,” Berchelt said. There was never any doubt that Berchelt wasn’t going to knockout Awuku. This is what Berchelt was expected to do with him fighting a guy that is unranked and just pulled in as a replacement. It’s too bad that Berchelt didn’t have a good opponent for the fight like Miguel Roman because it would have been a lot more interesting fight to watch. Next boxing news: Selby v Warrington General Sale Tickets Available Now!